SYRACUSE, N.Y. – Central New York is home to a slew of truly haunted houses, cemeteries of unrest and other locations where there is said to be paranormal activity. Many historical sites offer guided tours, especially in the summer and around Halloween, and some even allow people to participate in their very own investigations and ghost hunts. From “13 Curves” to Casey’s Cottage, following are 25 haunted locations in the Syracuse area that are said to be haunted by the spirits of the dead. So, if you want real scares that make the hairs stand up on the back of your neck, grab a flashlight and enjoy our list of haunted places. 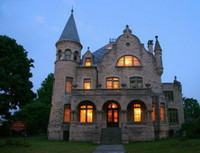 Beardslee Castle (Little Falls). At 123 Old State Road, a stone’s throw from the Thruway (Route 90) is the very haunted former home of John Beardslee (above). Built in the early 1800s and now a popular wedding venue – especially for fans of the supernatural – the ghosts include victims of the French and Indian War; a woman named “Abigail, who died the night before her wedding; and Pop Christensen, the first owner of the castle after it was turned into a restaurant. According to legend, Christensen hanged himself in the building. Brae Loch Inn (Cazenovia). This popular Scottish-themed inn and restaurant, located at 5 Albany Street, was originally the home of William Burr. According to reports, several rooms are haunted by visions that include a man in a kilt (known as “Scotty”), a young girl in a blue dress carrying a tray of candles and a shadowy male figure. Bull’s Head Inn (Cobleskill). Built in 1802, this inn at 105 Park Place didn’t stir up any spirits until the 1960s when a bar was added and disturbed the ghost of Mrs. John Stacy, an anti-alcohol advocate who is said to knock silverware, glasses and other items off tables. Both visitors and investigators have reported seeing an apparition in a long white dress, hearing doors slam shut and even communicating via flickering lights. Casey’s Cottage (Mexico). Mysterious occurrences are frequently reported at Casey’s Cottage, located at 120 Mexico Point Drive on Lake Ontario at Mexico Point State Park. Visitors claim they’ve seen candles flying off the mantel, flickering lights, chandeliers swaying and translucent figures. William Casey, for whom the house is named, is believed to be one of the ghosts – or perhaps the only ghost. Dr. Best House & Medical Museum (Middleburgh). This “time capsule” of early medicine at 1568 Clauverwie Road may be haunted by victims of archaic hospital procedures that are no longer practiced, or by the doctor and members of his family who died within the walls of the house. This house is a stop on the local “Haunted History Tours,” which take place in October. Erie Canal Museum (Syracuse). Several ghosts allegedly haunt the Erie Canal Museum at 318 Erie Boulevard, E., including men engaged in an argument, a woman who was killed in the building and children on the courtyard. Shadow Chasers investigated the museum in 2012. Fingerlakes Mall (Auburn). One night a watchman fled the mall located at 1579 Clark Street Road after encountering a ghost. In 2012, a ghost-hunting team investigated the mall and claimed to have recorded numerous anomalies. Book your own ghost hunt and see for yourself. Grapevine Farms (Cobleskill). According to New York’s Haunted History Trail, this 19th century farmhouse at 2373 New York 7 hosts at least four spirits. Now a gift shop and wedding/banquet, people have encountered phantom children running through the halls. If you’re interested, book a tour or an investigation. Fort Ontario State Historic Site (Oswego). This “Guardian of the Northern Frontier” at One East 4th Street was constructed by the British in 1755 and maintained as a U.S. military fort for centuries and featured on an episode of Ghost Hunters. Now it’s a creepy/fun place to visit. Phenomena range from strange lights to phantom music to a woman in an upstairs window to the disembodied of a child calling his cat. The fort hosts a ghost hunt every year in mid-October. Herkimer Home State Historic Site (Little Falls). Revolutionary War General Nicholas Herkimer built this Georgian Mansion in the Mohawk Valley in 1764. Considered a hero for defending Fort Stanwix against British red coats, he was wounded in battle and died at his home days later. The home is said to be haunted by phantom voices and footsteps, as well as a flying candlestick. Site tours are offered during a few months of the year only. Hyde Hall (Cooperstown). Did Juliette Gordon Low, Samuel F.B. Morse and Alice Lawless ever really leave this 19th century mansion at 267 Glimmerglass State Park? Stories of a curse and other “adult” hauntings are covered in the Hall’s summer and October “Hyde & Shriek!” tours. The 1890 House Museum (Cortland). The Atlantic Paranormal Society (TAPS) of Syfy’s Ghost Hunters investigated this old mansion (above) at 37 Tompkins Street where six members of industrialist Chester Wickwire’s family died. People who have spent the night in the house report hearing strange noises that “sound like ghosts,” making its October “Spirits in the Castle” tours a fun visit. Another haunted location in Cortland is the old building that once housed the Gillette Skirt Factory, where Grace Brown met Chester Gillette: Both came to tragic and untimely ends. People who have seen Gillette’s spirit say he’s wearing a white shirt with light-colored pants and carrying a tennis racquet. Onondaga County Criminal Courthouse (Syracuse). A woman called Claire allegedly haunts 505 S. State Street, the former site of the Syracuse Police Department parking garage. According to legend, in the 1950s, Claire jumped to her death after discovering her police officer boyfriend was cheating on her. Employees who work late at night have reported seeing her apparition or feeling her presence on both the top and ground floors of the building. Rome Capitol Theatre (Rome). For decades, attendees at this central New York music-and-movie venue, located at 220 W. Dominick Street, have reported shadowy figures, doors opening and closing of their own accord and the sounds of organ music, despite the fact building doesn’t contain an organ. Seneca Falls Historical Society Museum (Seneca Falls). In 2011, Paranormal Investigators of Central New York claimed they recorded sounds of two ghosts – Helen and Mary – talking. When the ghost-hunters returned to 55 Cayuga Street, they asked the women to move a ball on a table and it allegedly rolled into the lap of one of the investigators. Split Rock Quarry (Solvay). In 2007, the Ghost Finders Association of Central New York allegedly found evidence of ghosts at the quarry, where at least 50 men died in a 1918 explosion. Fifteen of the men were never identified and their corpses were laid to rest in a common grave. People have reported seeing strange lights, possibly the result of an exorcism performed at the site. Members of the ghost-hunting team captured a dark figure in one of its photos and Stephan Morasco claimed he experienced numbness and tingling just before the photo was taken. Sylvan Beach Amusement Park (Sylvan Beach). During a 2012 episode of Ghost Hunters, investigators announced they discovered “significant” paranormal activity at both the classic amusement park, located at 112 Bridge Street, and Yesterday’s Royal Hotel & Restaurant (now closed) at 13 Canal Street. The park is open from May to October and there are periodical “Park after Dark” tours of the spookiest locations. 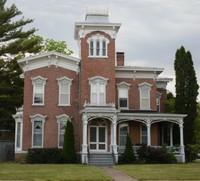 The Farnam Mansion (Oneida). Eight people died in the 19th century Italianate mansion pictured above. Formerly The Collinwood Inn with Dark Shadows-themed rooms, the house is located at 302 Main Street. Guests at the inn reported encounters with both human and animal spirits, phantom voices and objects moving of their own accord. In 2013, WRVO interviewed the owners of the privately-owned house concerning their paranormal experiences. In the past, the owners have hosted guided tours and in 2011, opened their home to an investigation by the New York Shadow Chasers. The Landmark Theatre (Syracuse). The Salt City’s most famous haunted venue is the theater at 362 S. Salina Street, home to “Clarissa,” who fell from a balcony to her death in 1930. The theater hosts various productions throughout the year. 13 Curves (Onondaga Hill). Sixty years ago, a young man and his new bride crashed on Cedarvale Road the two were found in different locations along the snaky road. People claim to have seen the strangely-glowing bride – usually on Halloween night – dressed in white filmy garments floating above the road in search of her husband. Utica Lunatic Asylum (Utica). The Utica Psychiatric Center is located at 1213 Court Street and its “Old Main” building is periodically open for tours. Stories of forced lobotomies and other questionable medical procedures. One such treatment, known as the “Utica Crib,” consisted of a coffin-like wooden bed surrounded by a cage. The “ghosts” at the old hospital are said to be former patients who were forced to endure such atrocities. Wayside Irish Pub (Elbridge). For a half-century, paranormal activity has been reported at the former Munro House at 101 W. Main Street. Anomalies include a transparent woman called “Sara,” who appears in an ankle-length dress. She is believed to have hanged herself on the third floor. Harry, a poltergeist-type ghost, and Squire Munro, the original owner, also haunt the building. Patrons have reported feeling cold sensations and being touched, poked and having their hair pulled. Sources: Geoff Herbert, Syracuse.com, October 3, 2018; New York's Haunted History Trail; Trip-Advisor; Dr. Best House & Medical Museum; Fort Ontario State Historic Site; The 1890 House Museum; "Grace Brown - Death on Big Moose Lake," What Lies Beyond, July 11, 2014; The Otesaga Resort Hotel; and The Seward House Museum. I've been to Cortland and know about Grace Brown, but I didn't know about the 1890 House. I'll have to check it out the next time I'm in that area. It's a spooky old house. It would make a good photo for the Halloween contest.